Home › Healthy Food › Healthy Eating.. The easy way. Healthy Eating.. The easy way. Its interesting, I am really an “all-or-nothing” type of person. When I run/exercise regularly – I want to eat well, focus on my over-all well-being, get enough rest, etc. When I get injured (which seems to be the only thing that really makes me stop exercising), I start eating chocolate cake.. Fast food.. Ice Cream.. etc. So, I want to change my focus to healthy living over all. This will help me when I can not run, to continue to focus on great things. You don’t have to deny yourself treats! One of the BIGGEST aspects of Healthy Living is the food we eat. I do very well at eating right – IF I pay attention. So I am returning to my using MyFitnessPal to track my eating habits. I have found that if I put in my food BEFORE I eat it, that I make much better decisions. In fact, If I know I am going to be having some sort of “treat” that day – I put that in first thing. As an example – today is my Son’s birthday. I know he wants the “Ultimate Chocolate Cake” from Wegmans. 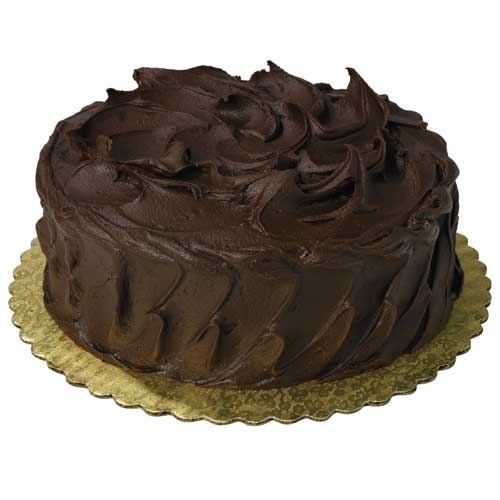 According to Wegmans.com – this cake is 300 calories for a small slice (1/16th of the cake). No problem, I entered in my 300 calorie cake this morning. Now I also know he chose to go to Boston Market for his Birthday. As far as eating healthy is concerned – he couldn’t have chosen a better location! On their website, they have a list of meals under 550 calories! This let me look over their generous selection of healthy choices (and the calorie count) before I go! So Dinner/Dessert will be around 850 Calories. This lets me watch what I eat the rest of the day, and what I choose to snack on, letting me still come in under my goal for the day! I won’t lie – it takes more effort than glancing at a menu and letting my taste buds pick out my meal. But it takes less time over all, because I get to save the time I would have spent beating myself up over eating poorly and not meeting my goal! With the right tools, and simply by paying attention – healthy eating is not difficult. 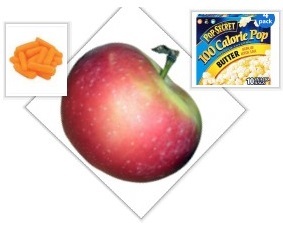 With snacks of baby carrots (no prep needed), apples, peaches, greek yogurt and 100 calorie microwave popcorn bags – keeping the numbers low is easy. Don’t believe people who tell you its HARD to eat healthy. It simply requires putting some food in a bag (notice nothing on my list required preparation? only proper purchasing at the store!) in the morning, instead of running out to pick up a bag of food at lunch! I have also found that entering in my caloric intake even when I am NOT doing well – lets me see a realistic picture of what is going on. It is better to enter the food after I eat it, than not at all. The fact myfitnesspal lets you “Friend” others – so they can give you encouragement (like The Curvy Roadrunner gave me today!) – doesn’t hurt either! You will also find that you have more energy and it WILL improve your runs! And if the healthy eating makes you lose weight? Remember, you will still run with the same amount of force – but you will move less weight.. What does that mean? FREE SPEED IMPROVEMENTS!!!!!! 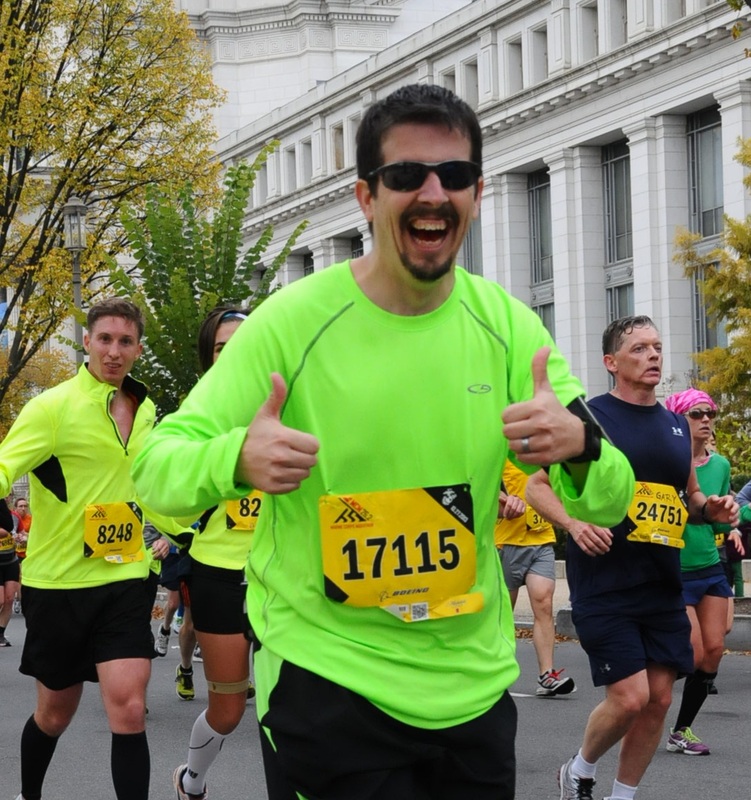 That’s right – Carrots can give you a PR! So tell me, what methods have helped you to form healthier eating habits? So, you have seen this on the bottom of my posts, and just skipped to the next thing you have to read. Please stop and consider this thought for me. What is $5 to you really? 2 cups of starbucks? Not even a lunch? Perhaps you can follow some of the healthy eating tips above – and spare 5 bucks from the money you will save. Please consider donating to help the homeless. We can make a difference – and your $5 donation immediately becomes 10 dollars. Donations are processed through the Fannie Mae website, and are securely made.